The 23 students were among 100 who were selected out of nearly 7,000 applicants to travel to the United States and tour different universities. Other groups of Iraqi students visited the University of Texas, Cal State San Marcos and the University of Arkansas. The group in Spokane spent a half day on campus. 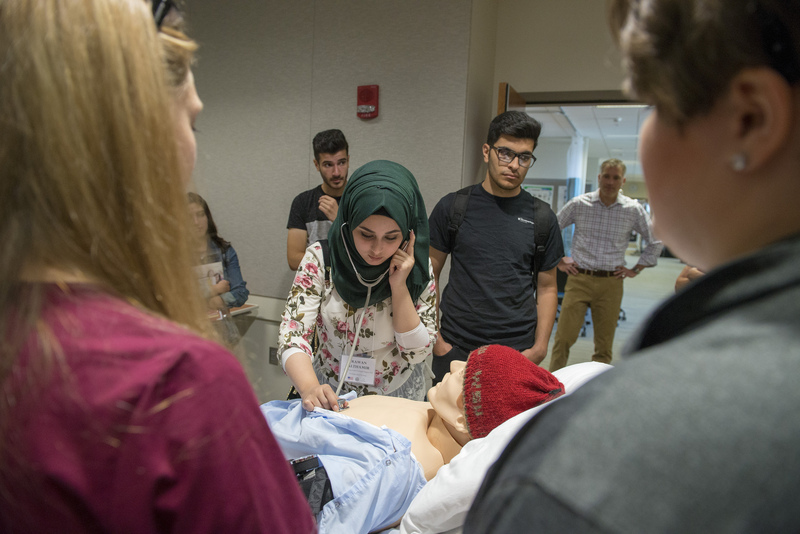 The five health sciences programs on campus – medicine, nursing, pharmacy and pharmaceutical sciences, nutrition and exercise physiology, and speech and hearing sciences – showcased their education offerings in brief presentations before the students were off to tour the labs on campus. The program presentations revealed a lot of similarities and differences between the way health sciences students are educated here and in Iraq. For instance, Ken Roberts, a vice dean in the Elson S. Floyd College of Medicine, asked about the cost of attending medical school in Iraq. “It’s free,” one student responded. That surprised the staff and faculty in attendance and illustrated one way in which medical education is different across continents. Other questions dealt with what kind of research happens here (the students were interested in the cancer research, for one), as well as what kind of technology is available for students on our campus. That technology question was answered during the tour session when the group split into three groups and rotated among the anatomy lab, Pharmacy’s compounding lab and Nursing’s simulation lab. 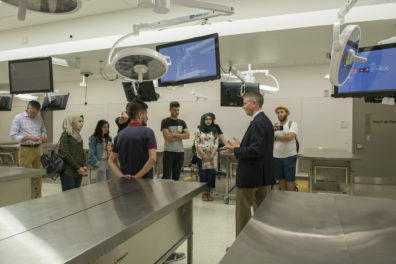 The students were fascinated by the anatomy lab, where medical students work with cadavers throughout the school year. “These are medical students’ first patient,” Roberts said. The students were also impressed with the technology in the lab, specifically the monitors above each bench that had real scans of the cadavers for students to work with. 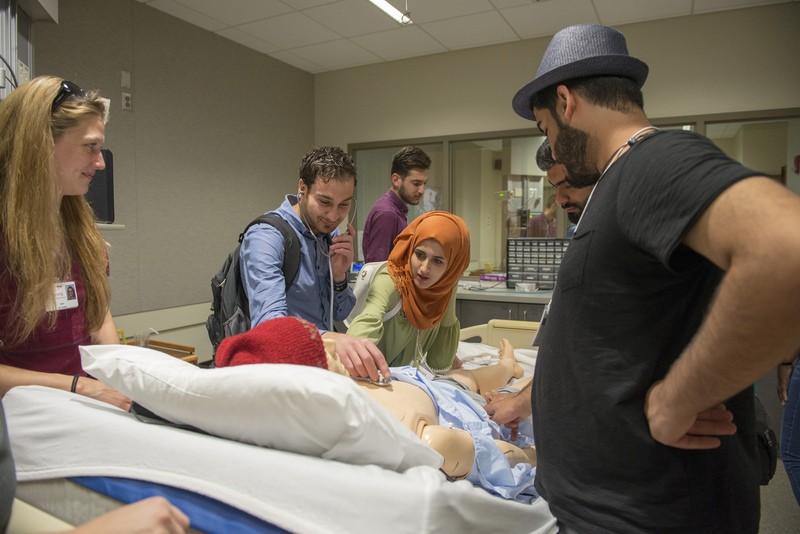 The College of Pharmacy and Pharmaceutical Sciences and the College of Nursing’s simulation labs showcased how students on campus learn through simulation. In both labs, a mannequin is used for simulation exercises and faculty can observe via video and behind a two-way mirror. The students got to use stethoscopes and listen to the simulated lungs in the Nursing Simulation Lab.